President Quirino, officially the Municipality of President Quirino, (Filipino: Bayan ng President Quirino; Hiligaynon: Banwa sang President Quirino; Ilocano: Ili ti President Quirino , is a 3rd class municipality in the province of Sultan Kudarat, Philippines. According to the 2015 census, it has a population of 41,408 people. President Quirino was formerly called as Sambulawan and it is actually the portion of the Municipality of Buluan, Maguindanao and Tacurong City. Pres. Quirino was created into a separate municipality on November 22, 1973, at the same time when the Province of Cotabato was divided into the provinces of North Cotabato, Maguindanao, and Sultan Kudarat, by presidential decree 341 of President Ferdinand Marcos. President Quirino is located at the center of Central Mindanao. It is 110 kilometres (68 mi) from General Santos City, 108 kilometres (67 mi) from Cotabato City, and 248 kilometres (154 mi) from Davao City. It is situated at the crossroads of the Davao-Gen. Santos-Cotabato highways. In the northern part is the municipality of General Salipada K. Pendatun, Maguindanao, in the eastern part is municipality of Buluan, Maguindanao, in the western part is the city of Tacurong and the southern part is the municipality of Tantangan, South Cotabato , in south-eastern part is municipality of Lutayan and Mangudadatu. President Quirino is a vast plain municipality having one barangay (Estrella) extending to the lakeside of the famous Buluan Lake. It has four existing types of soil namely; tinambulan peat, Banga sandy loam, Lutayan clay, and hydrosol. President Quirino is politically subdivided into 19 barangays. People speak Maguindanao, Tagalog, Cebuano, Ilocano and Hiligaynon. Most of the residents came from Pangasinan, Ilocos Sur and National Capital Region, with significant settlers from Iloilo and Negros. Indigenous people such as Blaan, Manobo and T'boli can be founded in Barangay Bagumbayan, Manobo can be found on Barangay Kalanawe I and Barangay Tinaungan, Blaan from Barangay San Jose and Islam or Muslim on Barangay Bayawa as the barangay is near to the Municipality of Buluan which is from the province of Maguindanao. President Quirino is the one of the economic and agricultural town in the Philippines, some of this is selling "sukang tuba at tubo" or vinegar of the coconut/sugarcane. And one of this is the finest "muscovado", is a type of partially refined to unrefined brown sugar with a strong molasses content and flavour. Small-scale industries include electronics and repair shop, car/motor vehicle body builder/repair shop, vulcanizing and machine shop, shoe and appliance repair shops hollow blocks/culvert making basket/mat weaving, dressmaking/tailoring, balut making, bakery. Other major industries is the rattan making, Banana, Coconut, Palay, Corn and African Palm Oils. People doing an corn -drying process, rice milling and other milling process, are found in the poblacion or in central town. Sambuyawan is celebrated every third week of November on giving way on its foundation in 1973. Cultures, local products, and tradition are shown in the festival such as Street dancing, drum & lyre, singing, dancing and other activities. Festival's name was derived from the former town named Sambulawan. The Muscovado Festival is celebrated every December 12, In which people must be recognized the town's own economic product which is Tagapulot or sweet Sugarcane candy from the sugarcane plantations. President Quirino has no any public transport terminal, but there has habal-habal, jeepney, multicab, and bus transportation where you can hop in around the Kidapawan-Junction highway. President Quirino has an official lane of Smart Communication tower substation and Globe Telecom substation in Barangay Poblacion. ^ "Presidential Decree No. 341, s. 1973 | GOVPH". Official Gazette of the Republic of the Philippines. Retrieved 9 September 2017. 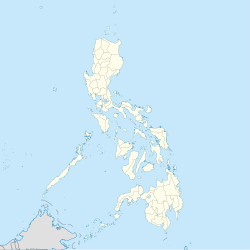 ^ "Province of Sultan Kudarat". Municipality Population Data. Local Water Utilities Administration Research Division. Retrieved 17 December 2016. This page was last edited on 16 March 2019, at 08:37 (UTC).